Ah, Memorial Day! The first long weekend of summer, when millions of Americans celebrate with backyard parties, beach trips, parades and general revelry. But is that what Memorial Day is really about? In truth, this is a holiday meant for remembrance. It’s a somber occasion, thinking about those who have lost their lives for our country, and the families they left behind. 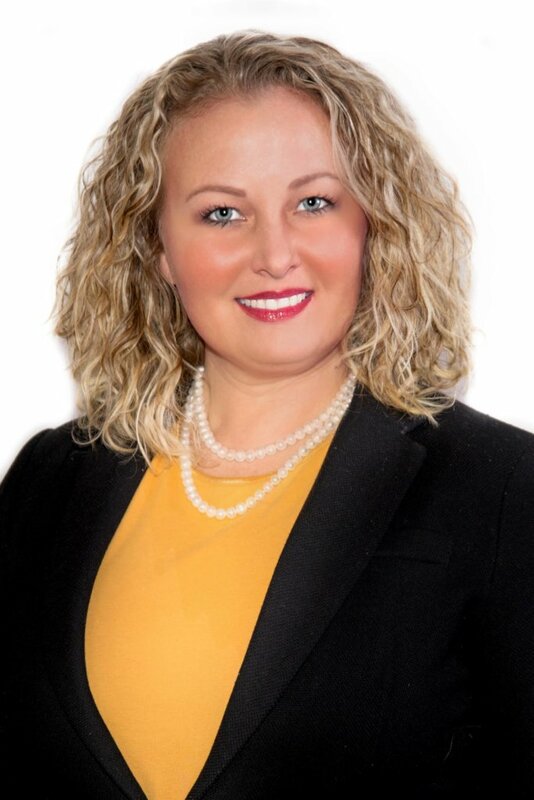 For many families bereaved of a loved one who was serving in the armed forces, the celebrations on Memorial Day are a painful reminder of loss. 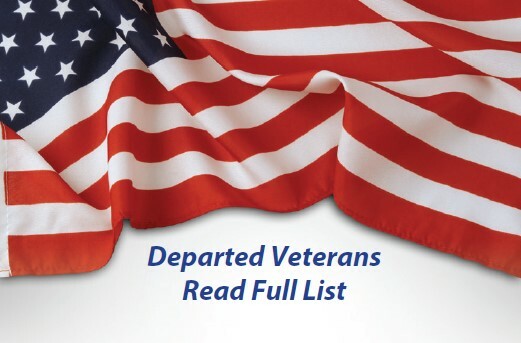 Visit a cemetery that honors veterans. A cemetery where veterans receive honor and recognition is a good place for reflection, and the monuments can be a powerful reminder of the overwhelming sacrifices that have been made. If your loved one’s final resting place is at a cemetery, decorate his or her space. If not, you might want to bring flags or flowers to decorate the graves of those whose families haven’t done so. We deeply respect and appreciate the sacrifices made by our nation’s military troops and their families. That’s why we work especially hard to honor veterans, working with their families to ensure that they receive the full honors to which they are entitled. 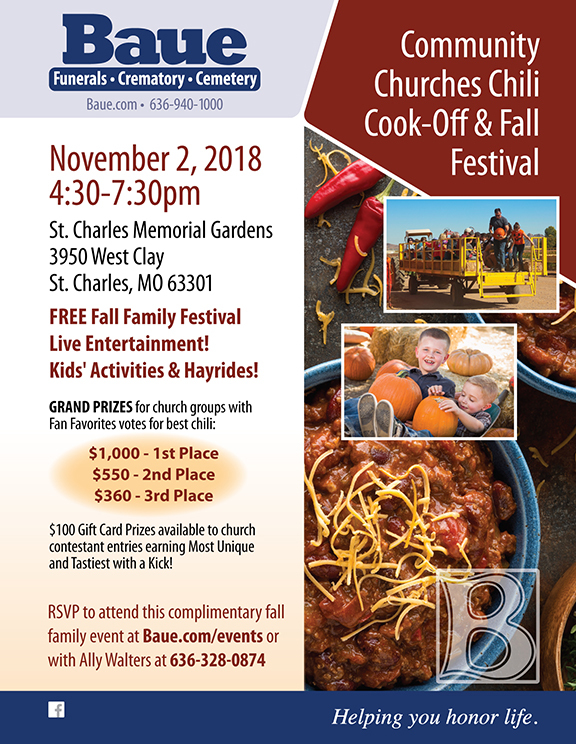 For more information on our services, and how to plan a life-honoring tribute that memorializes the service of an American hero, contact us at (636) 946-6935 or stop by St. Charles Memorial Gardens, located at 3950 West Clay Street, St. Charles, Missouri for more information. In the meantime, we hope everyone has a meaningful Memorial Day. For the last 57 years on Memorial Day weekend, we pay Honor and Tribute to our Country’s Veterans who, for many, made the ultimate sacrifice so we could enjoy our many freedoms. 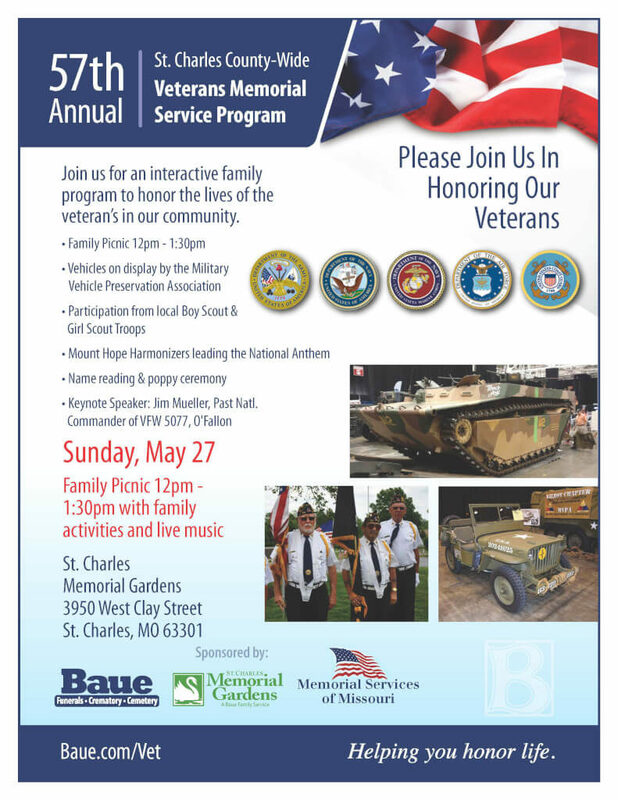 On Sunday, May 27th, the Veterans Memorial Program is adding new and exciting activities for all ages and families at St. Charles Memorial Gardens. We encourage you, your family, and friends to be in attendance for our picnic, activities, and program. This event is completely free and open to the public. A flyover of an F-15 Eagle Aircraft will take place (pending operational ability) before the start of the Veterans Memorial Service which includes reading of the names and a poppy ceremony. 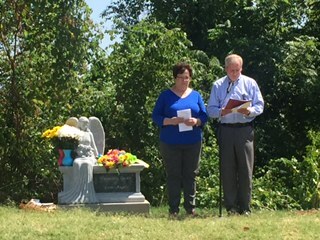 We gathered today with a group of bereaved moms, dads, and family members to dedicate this beautiful angel memorial bench to all the babies who have died too soon. Baue and St. Charles Memorial Gardens along with Wilbert Industries donated this bench in honor of these babies and for all who love them and will continue to grieve them.We are proud to partner with Share Pregnancy and Infant Loss Support to honor and support the families in our community who grieving their baby’s death. During our recent 2017 Veterans Memorial Program we read the names of veterans who have died this past year. Join us in remembering them and their service to our country. Every year in May, we pay Honor and Tribute to our Country’s Veterans who, for many, made the ultimate sacrifice so we could enjoy our many freedoms. On Sunday, May 29th at 2:00pm, our service takes on even more meaning, as we celebrate 55 years of honoring Veterans with our Annual County-Wide Veterans Memorial Service Program at St. Charles Memorial Gardens. 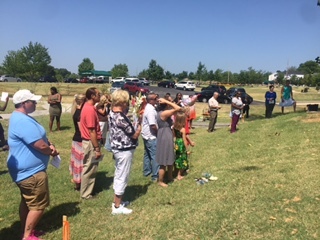 The complimentary program, sponsored by the Memorial Services of Missouri, and Baue Funeral Homes, Crematory & Cemetery allows family members of Veterans who have passed away within the last year the opportunity to join us in our Poppy Ceremony. The names of their loved ones will be read and a bell will be rung for each Veteran to symbolize our deepest gratitude for their service. This year, we welcome our guest speaker Wendell Webb, National Senior Commandant, Marine Corps League. We encourage you to pause for a moment of silence and remembrance as you visit our cemetery gardens and see the thousands of flags flying in tribute to our service men and women. 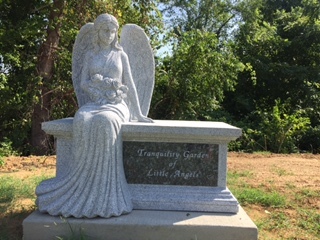 Founded in 1961, St. Charles Memorial Gardens is the only cemetery in the St. Charles County area with a dedicated Veterans Garden and Memorial Service. As we gather at 2:00pm on Sunday, May 24th outside our “Field of Honor,” we will pay tribute to all Veterans and their surviving families. Prior to our event, we will host a Flag Placement Day on Wednesday, May 25th at 9:00am. Veterans and volunteers from across the county will gather at St. Charles Memorial Gardens to place flags at each Veteran’s marker. Anyone who wishes to participate in the flag placement may do so by contacting Baue Community Services at 636-946-4042 for more information. Our program is free and open to the public. We welcome you, your family and friends to join us as we honor our veterans.